Sure, tacos and barbecue may form the foundation of Austin gluttony, but even the most dedicated migas and brisket addicts will concede that pizza is a crucial third of the not-particularly-healthy ATX food pyramid. From massive NY-style pies to delicate wood-fired Neapolitans to outliers like Detroit squares, Austinites love a slice of pepperoni almost as much as a slice of fatty brisket. 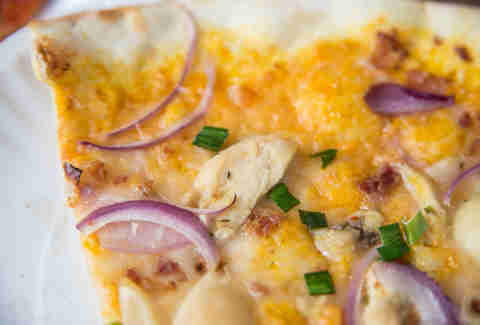 Here are the best pizza spots in town, with a little extra cheese. Many an evening has ended early due to the gluttonous temptation of Via 313. 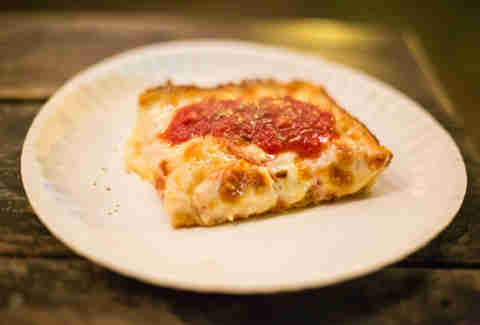 Their Detroit-style pies are four square slices of thick, pillowy crust, given extra crunch thanks to a light caramelization of cheese. Two pieces make a perfect bar snack and three a full meal, but that fourth slice is a one-way, direct ticket to bedtime. For the full experience, go with the double pepperoni Detroiter, but even the arugula-topped Rocket is in strict violation to most diets. The Home Slice employee pilgrimages to New York's most iconic pizza shrines are the stuff of legend, so you know they're not just dollar-slice carpetbaggers. 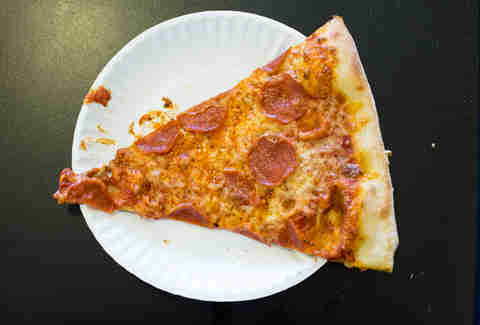 The slices are as big in size as the staff is in personality -- even the Friday 2:30am counter dudes are surprisingly cheerful in the face of belligerent spillover from the Continental Club. They have reason to be with pizza this good, classic margherita, pepperoni with the perfect level of grease, and white pies heaped with balloons of ricotta that give their still-great mozzarella a run for their money. The Sicilian pies are a perfect answer to a case of the Mondays. The wait for a seat may be long, but the pizzas pop out of their post oak-fired oven in 60 seconds flat. The crust of Bufalina's Neapolitan pizza is so delicate you might hurt its feelings just by picking it up -- ask for penance, because you'll want to pick up many, many slices, from classics like margherita and calabrese, to experimental pies like the harissa (cauliflower, green olives, pistachio, herbs) and chorizo & potato (mozz, jalapeño, crema, pickled onion, marjoram). Bonus points for perhaps the most swipe-right-worthy clientele of any pizza joint in town. East Side Pies might be the most Austin-y pizza shop on this list. A visit to the claustrophobic original Eastside location feels like a step back into the '90s (although it opened in 2006), before interior design consultations were requisites for opening even the tiniest of hole in the walls. The attitude is also decidedly slacker-ish, walking the thin line between a no-fucks-given attitude and thoughtful ingredient sourcing. While the crust is cardboard-thin and doesn't pack the wow-factor of spots like Bufalina or Via 313, the creative sauces (chimichurri! hummus!) and gratuitous toppings of local produce more than make up for a sometimes floppy slice. It doesn't get much more wholesome than Little Deli. Tucked into a quaint Crestview strip mall that's quizzically on an otherwise residential street, this sandwich shop excels at big, Northeast-style slices cooked in 2-inch stone hearth ovens. There's nothing fancy going on here, just an old-school dough recipe executed to craveable perfection, although Little Deli's got new-fangled diners covered as well with an option for Ancient Grains gluten-free crust. With the exception of Hoboken (and a few acceptable chains), the local Downtown pizza game is fairly dismal. 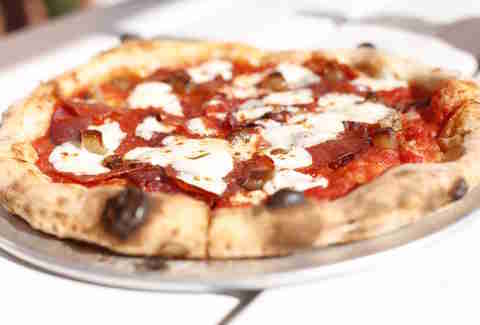 Thankfully, Backspace upped the ante in 2010 when it opened behind Parkside, bringing some of the city's first (and still finest) wood-fired Neapolitan pies. Its app game is the most robust on this list, with an impressive selection of shared plates (lamb & pork meatballs, baked ricotta) and antipasti (house-made mozz), but the pizzas are obviously the main draw. The ingredient combinations tend to be minimal, keeping knockouts like fennel sausage and picante salame from withering under piles of unwanted veggies. Hoboken boasts being “proud like the pigeon,” which is a fitting tagline since many of its late-night clientele have been reduced to the level of mindless scavengers. Despite the barebones “dining room” (with Parmesan and pepper shakers chained to the wall, bank pen-style), the Jersey-influenced pies deliver a satisfying experience to both Dirty Sixth zombies and clear-eyed diners alike, thanks to a can't-miss crust and some of the most flavorful cheese and sauce in town. For nearly a decade Manor Road has been the breakfast taco epicenter of Austin, but the rest of the eats have finally caught up to the migas. Hiding behind Dai Due, Unit D is the newest addition to the street and makes a strong case for the Manorhood as the premiere culinary block in town. 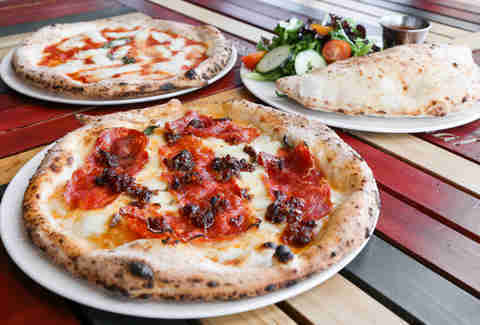 The oven, created by a Naples-based oven maker in the biz for over 100 years, cranks out bubbly crusted pies in winning combinations like the pepperoni primo (tomato, pepperoni, bresaola, lardo ibérico, mozzarella, spicy Calabrian peppers), which are taken to the next level thanks to fresh side garnishes like oregano sprigs and crushed chilis. Second Bar + Kitchen often catches flack for being “too Downtown,” but we can see past the martini-drinking solo businessmen and awkward date conversations in the echo chamber-like dining room to see the true beauty of the eatery: consistency. And the food critic-approved pizza is no exception -- the Black + Bleu is a testament to balance with its funky black truffle and blue cheese, salty pork belly, and sweet caramelized dates on a thin-yet-dense crust. 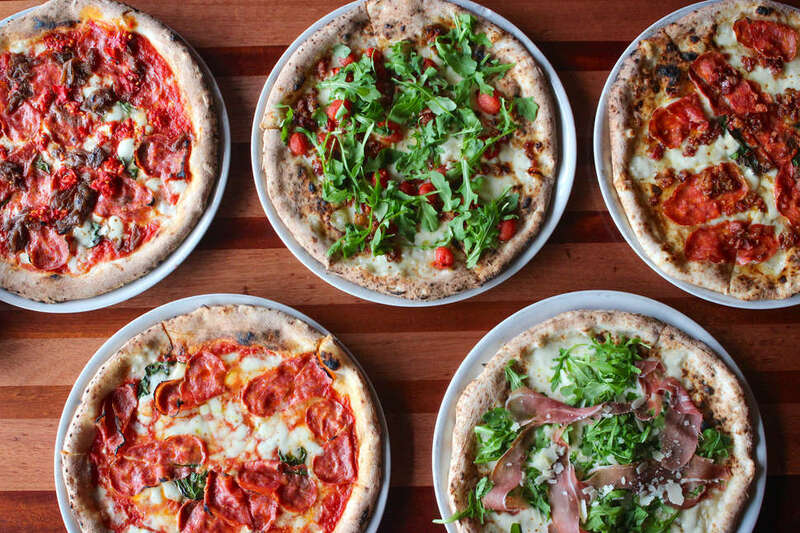 Dallas-based Cane Rosso follows strict Italian standards for its authentic Neapolitan pizzas and its fresh dough is made daily, San Marzano tomatoes are hand-crushed and mozzarella is pulled fresh in-house daily. 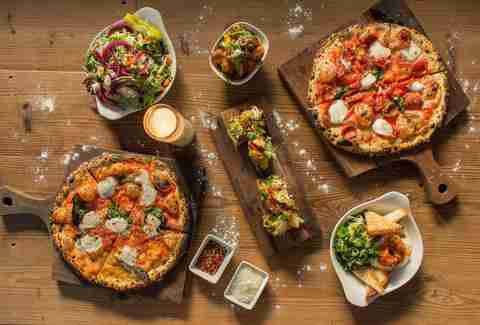 The pizza is fired in a custom, wood-fired at 900 degrees for 90 seconds resulting in a delicate charred crust. And thank baby Jesus, Cane Rosso serves actual cocktails, in this case Italian-inspired drinks with familiar liqueurs like Campari and Aperol that are a welcome sight in our beer-and-wine-only pizzeria landscape. If you haven’t had the pleasure of scarfing half of a Pieous pie after a long afternoon sampling spirits and beers off of Fitzhugh Road, you haven’t lived. 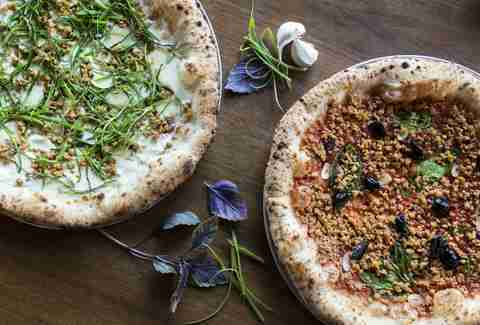 The wood-fired, thick sourdough crust leans Neapolitan, and the house-smoked pastrami (which you can add to your pizza) are what make Pieous a destination for those of us who reside in Austin proper. You can’t go wrong with any choice, but we love the fiery House on Fire (tomato sauce, fresh mozzarella, salame calabrese, spicy onions, Calabrian peppers, and chili flakes). Dan Gentile is a freelance writer based in Austin, TX who can't resist the fourth slice of Via 313. Follow him to his couch at @Dannosphere.